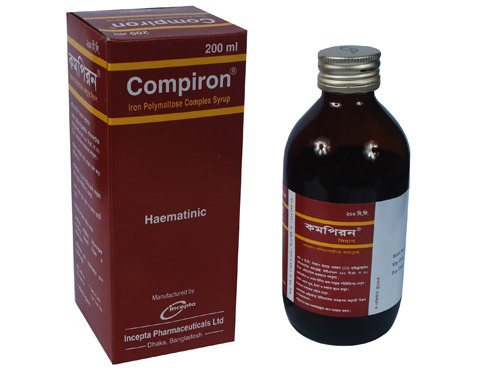 Compiron syrup: Each 5 ml of syrup contains Iron (III) Hydroxide Polymaltose Complex INN 200 mg equivalent to 50 mg of elemental iron. 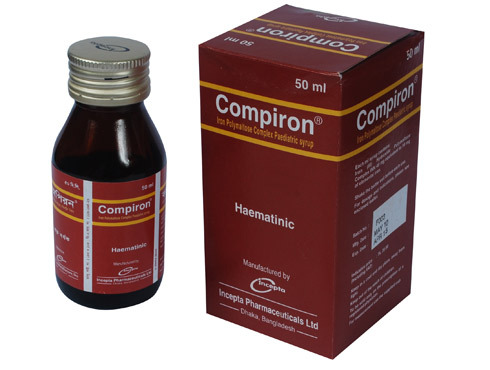 Compiron paediatric syrup: Each ml syrup contains Iron (III) Hydroxide Polymaltose Complex INN 40 mg equivalent to 10 mg of elemental iron. 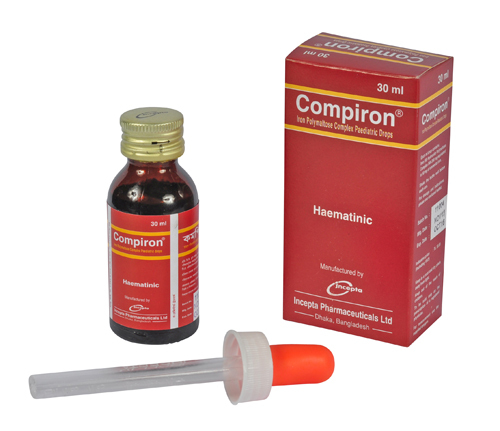 Compiron paediatric drops: Each ml drop contains Iron (III) Hydroxide Polymaltose Complex INN 200 mg equivalent to 50 mg of elemental iron. Iron Polymaltose Complex is a polysaccharide-iron complex, which is a novel iron preparation used in the treatment of iron deficiency anaemia. Iron, an essential constituent of the body, is necessary for haemoglobin formation and for the oxidative process of living tissue. Compiron contains non-ionic ferric iron and polymaltose in a stable complex. This facilitates a controlled absorption of the ferric iron when it comes in contact with the mucosal cell surface. Being non-ionic, it does not release any free radicals and thus takes care of all the toxic effects found due to the release of free radicals by the traditional ionized iron salt preparations. It does not interact with the food components and other medications and so, unlike ferrous salts, there is no decrease in bioavailability of Iron Polymaltose Complex. This makes sure that with the consumption of this complex, iron gets utilized at a faster rate in the haemoglobin and myoglobin synthesis. • Treatment of latent iron deficiency and iron deficiency anaemia including macrocytic anaemia,nutritional anaemia of infants, anaemia due to excessive haemorrhage and anaemia associated with infections and malignant disease. • Prevention and treatment of iron deficiency anaemia before, during and after pregnancy and during lactation. • For prophylactic therapy of iron deficiency to cover the recommended daily dietary allowances (RDA). Dosage and duration of therapy are dependent upon the extent of iron deficiency and should be taken as directed by the physician. Premature infants & Infants: 3.33 mg of elemental iron/kg body weight (0.06 ml of Compiron drops/kg body weight) daily. This preparation is well tolerated. However, a few side effects of oral iron preparations, including nausea, vomiting, constipation or diarrhoea may occur.